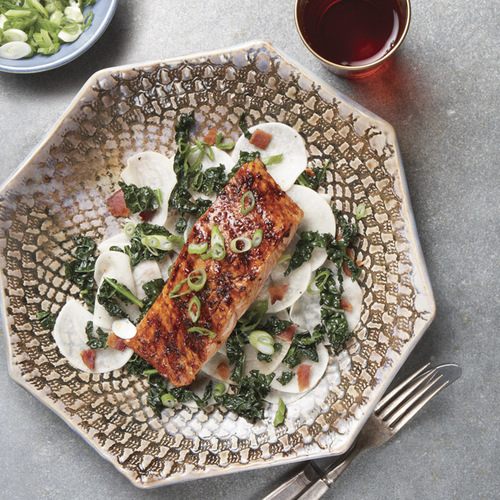 With its bold, rich flavor and buttery texture, pink hued salmon is an easy fish to love. 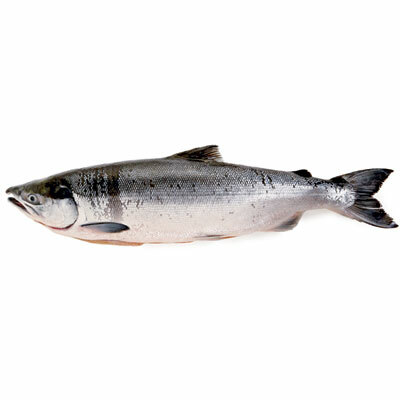 Farmed salmon has a rich, fatty texture, while wild salmon has a leaner texture and a more complex flavor, so it mustn’t be overcooked. 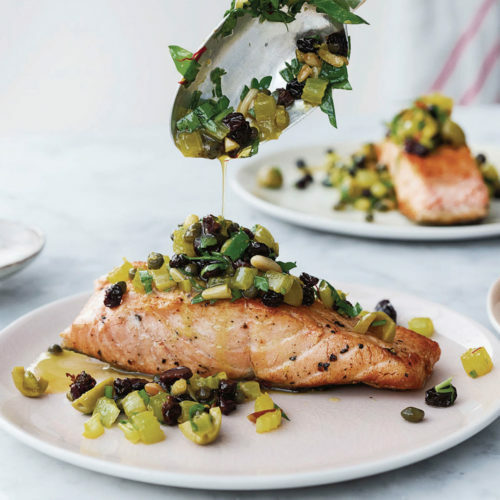 Fresh salmon may be poached, grilled, baked, and seared and is best paired with ingredients that can both highlight and temper its somewhat pronounced flavor. You can buy salmon whole (with head and tail on), a whole skin-on side, cut into fillets (pieces cut from the side), or cut into steaks (horseshoe-shaped pieces cut crosswise to include the backbone). 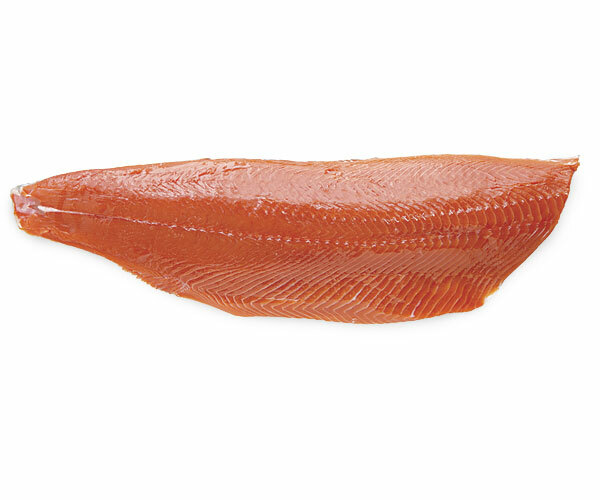 Salmon is also popularly cured (as in gravlax) or cured and smoked. It is also available canned. 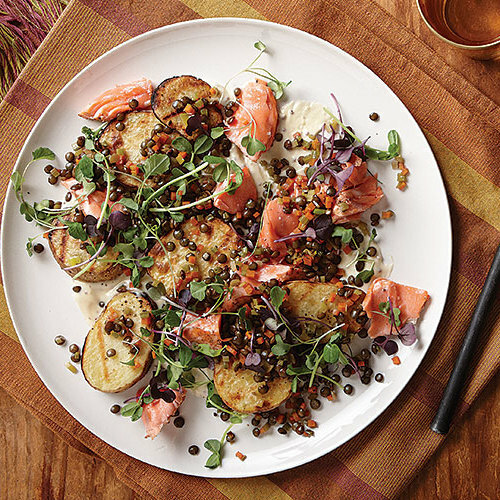 Arctic char is the closest substitute for salmon’s flavor, texture, and color. 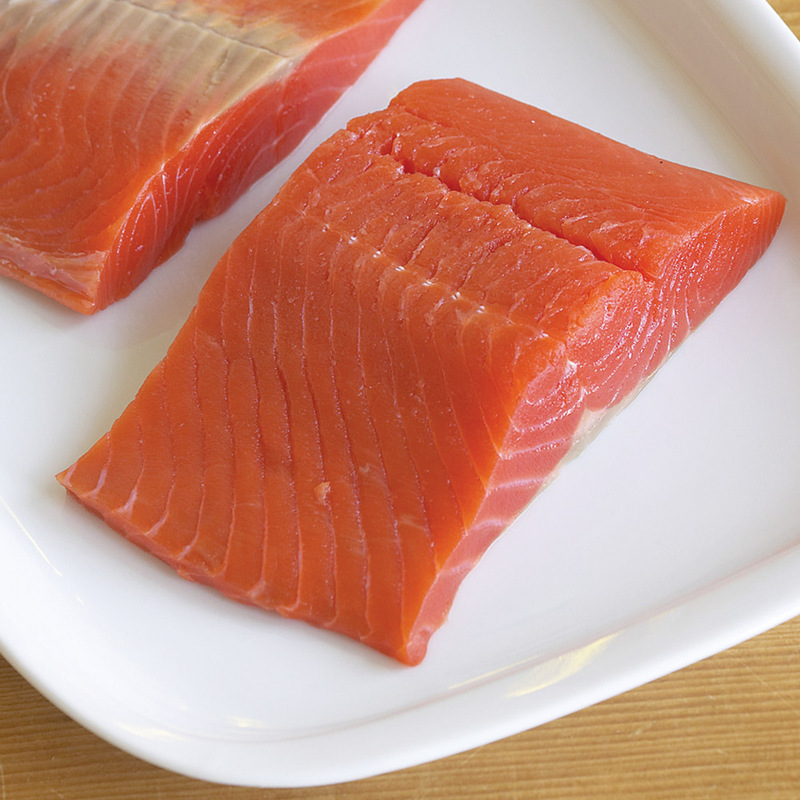 You’re most likely to find farmed salmon in your grocery store, but if you keep your eyes open (or ask for it), you might find wild, likely Alaskan salmon, which is available nationwide throughout the year. Variations in color are natural, but no matter the hue, the skin is the best indicator of freshness: It should be shiny and silver. Also, the flesh shouldn’t be “gapping” (flaking apart with apparent holes), a sign of aging. 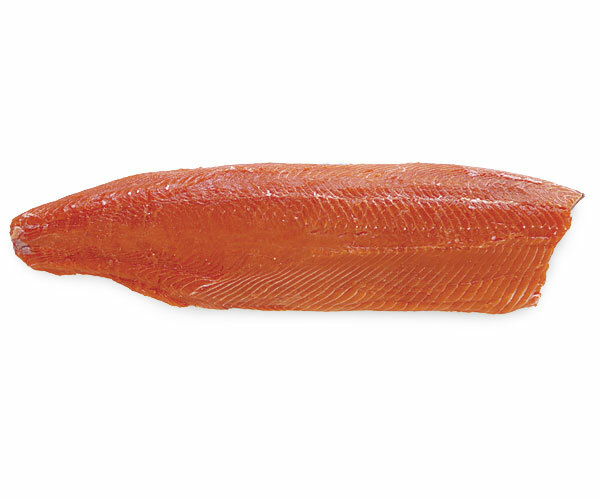 If buying whole salmon, the eyes should be clear, not gray or cloudy, and the gills should be vibrant and bright red. The aroma should be clean and briny, like the sea, but not fishy. If possible, buy your salmon from a reputable fish market. Look for fish with the skin on (it’s freshest) and ask the fishmonger to remove it for you. 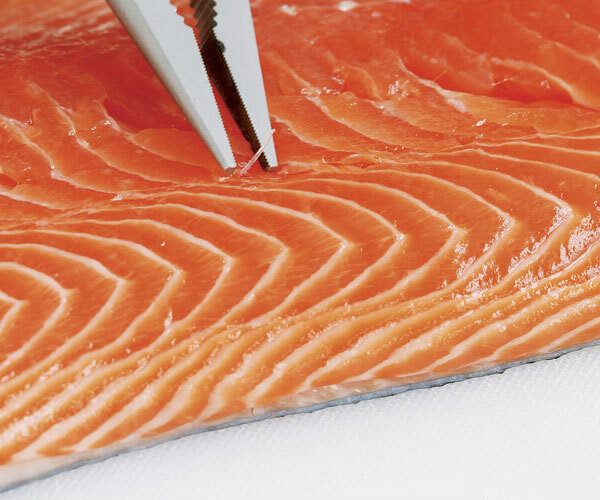 You’ll get even fresher fish if you buy part of a side and cut fillets from it yourself. 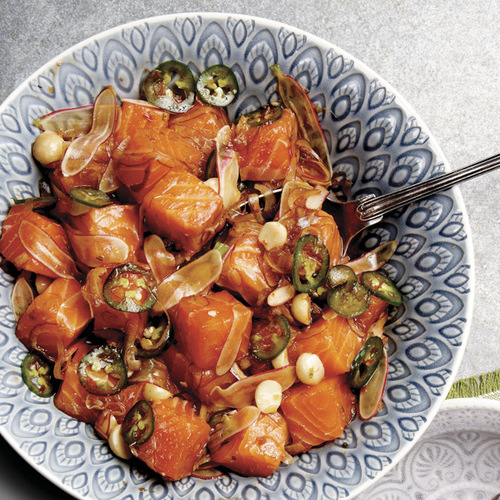 There are actually seven species of wild Pacific salmon, but the five below are what you’ll find at the market; the other two, found in Asian waters, are rarely sold in North America. 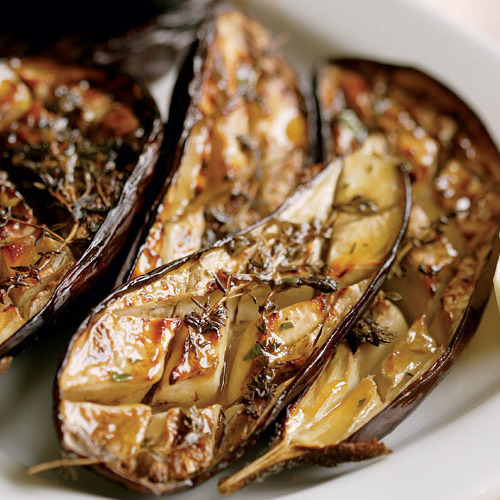 There are subtle differences in the texture, color, and flavor of each species. 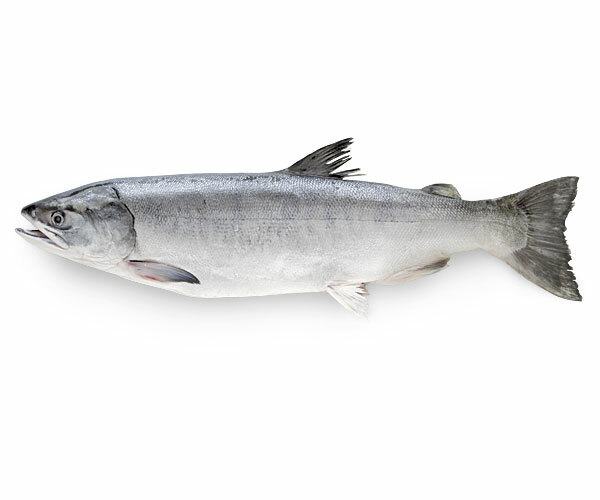 Also called Chinook, this is the largest Pacific salmon species (average adult weight is 20 lb., but it can go up to 50 lb.). 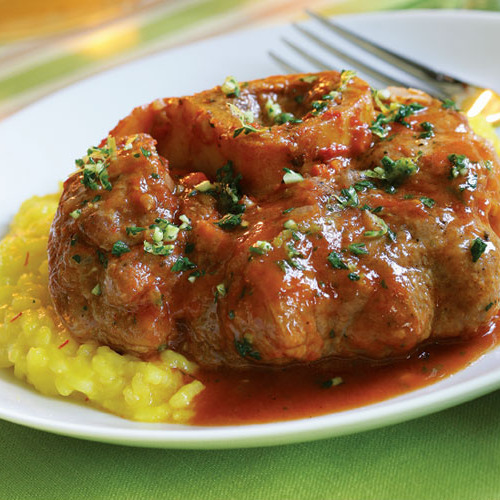 It’s the earliest to market and the most sought after, prized for its high fat content and meltin- your-mouth flesh that ranges in color from ivory to deep orange-red. Known as “red salmon” by fishermen because its skin changes from gray to bright red during spawning season, sockeye is a smaller species (average weight is 6 lb.) 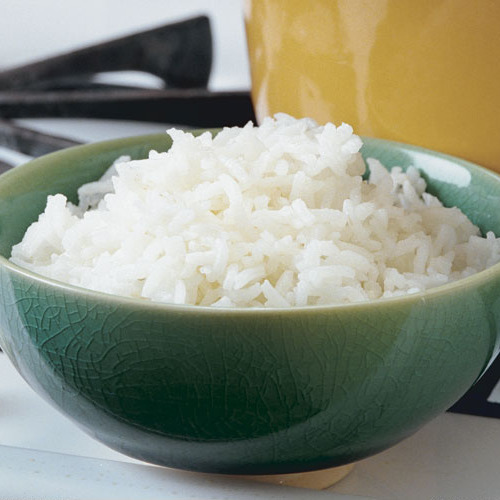 with the firmest texture and a strong, rich flavor. 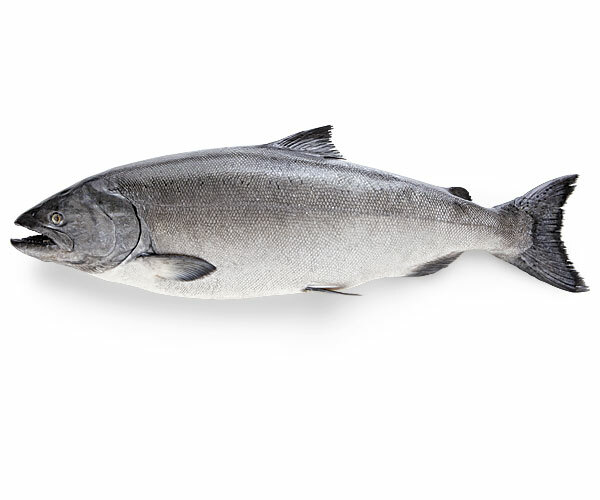 Also called “silver salmon” for its bright, silvery skin, coho’s deep orange flesh is firm and meaty, with a more delicate flavor than king salmon. Cohos are the second largest species, with an average weight of 12 lb. 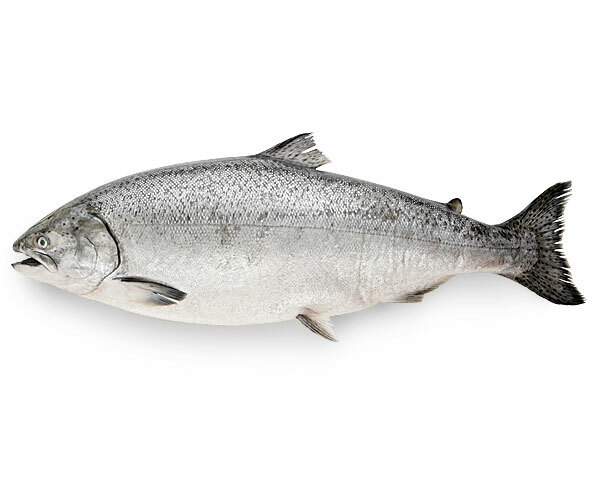 Formerly called chum, this medium-size salmon (average weight is 8lb.) 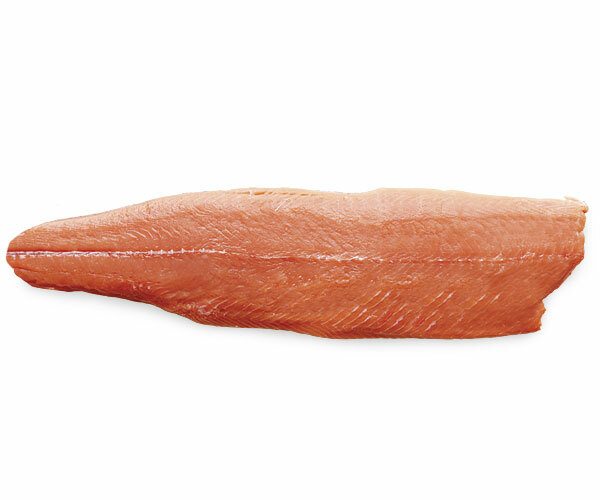 has firm, light orange-pink flesh, a mild flavor, and relatively low fat content. 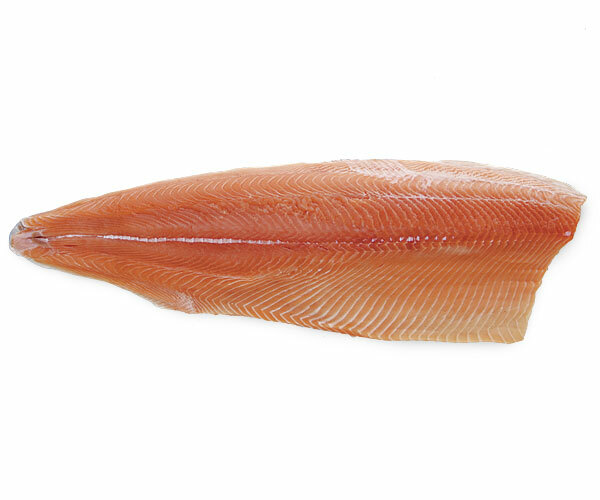 It’s often smoked, but recently, it’s become more popular as an affordable fresh fish. Sushi lovers prize keta’s large, juicy eggs. The most abundant of all the species and the smallest (average weight is 2 to 3 lb. ), pinks have rosy flesh, a tender texture, and the second-highest fat content. 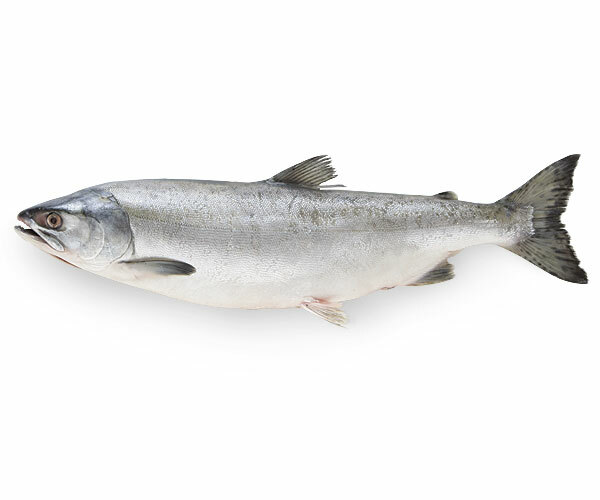 They are often smoked and/or canned, but have recently gained favor as an economical fresh or frozen choice for those who appreciate mild-flavored fish. 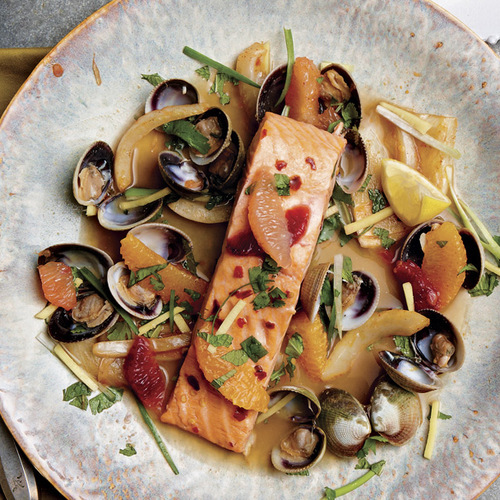 • For the best flavor and texture, buy fresh wild salmon the same day you are going to cook it. 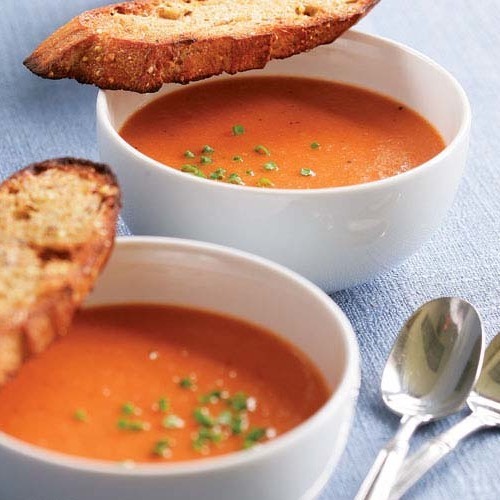 • For whole salmon, the eyes should be clear and moist, not sunken or red. 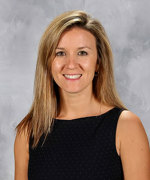 The gills should be bright pink or red, not brown or gray. • For fillets and steaks, look for tight flesh with no gapping. Gaps appear as the flesh deteriorates and can also be a sign that the salmon was handled roughly during processing. 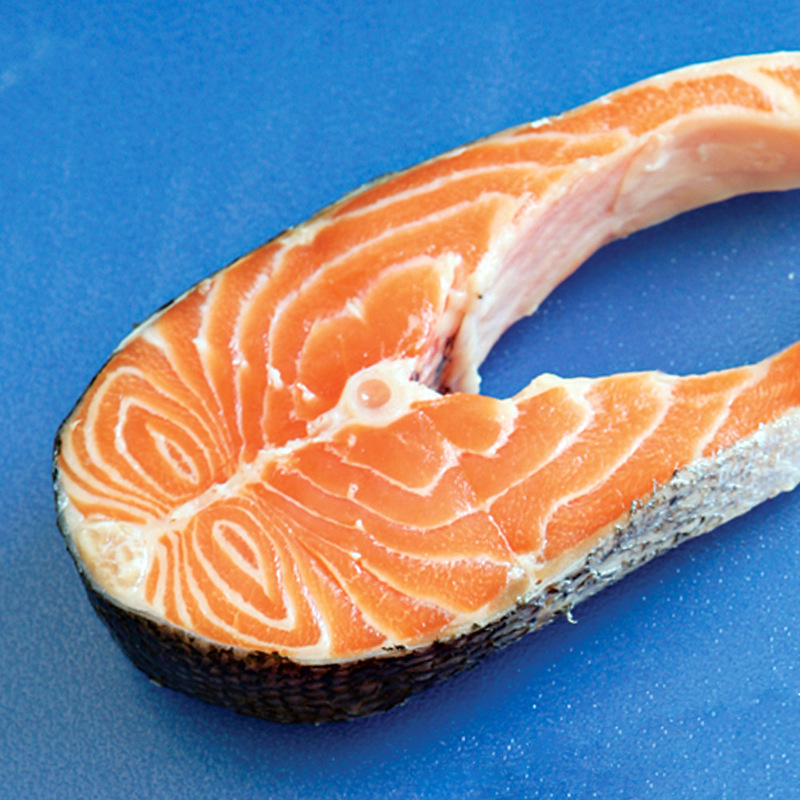 • Larger fillets from the head end of the salmon tend to have a more uniform thickness, so they cook more evenly. 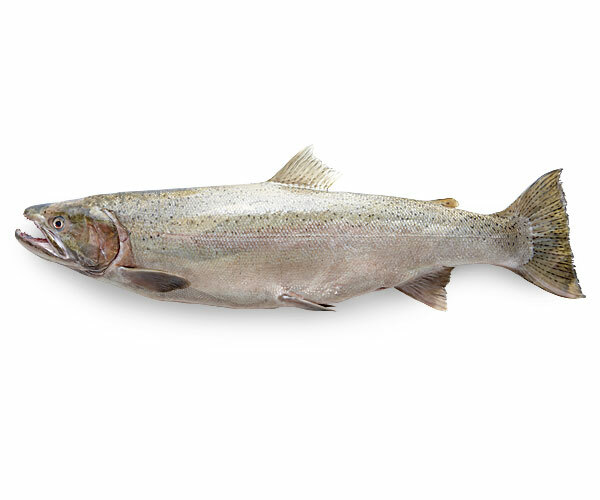 • Look for salmon displayed on mounds of ice or in dry trays at the fish counter; when fish sits in liquid, its flavor leaches out. Run your fingertips up and down the center of the flesh, feeling for tiny pin bones. If you find any, use a pair of needlenose pliers or tweezers to yank them out. Beginning at the tail end of the fillet, work the edge of a sharp, long and narrow slicing knife between the flesh and skin. If you don’t have a tail end, start at one corner of the fillet and work your way in until the knife is between the skin and flesh all the way across one short end of the fillet. 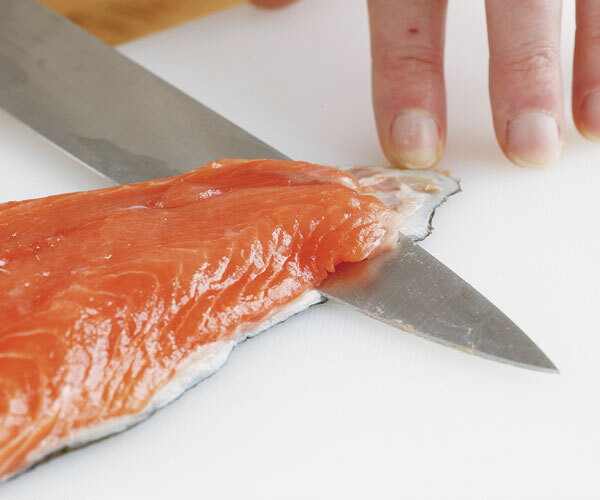 With your free hand and using a paper towel for better traction, grasp the just-freed end of skin and pull on it as you run the knife down the length of the fillet in the opposite direction. 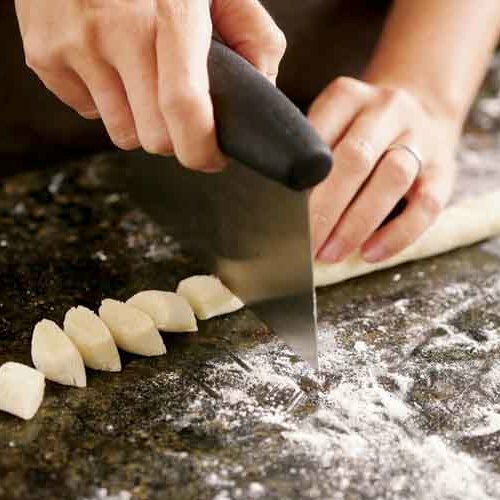 Keep the knife angled slightly down toward the skin, and use a slight sawing motion if necessary. The skin should come off in one piece. At home, keep the salmon well-wrapped. 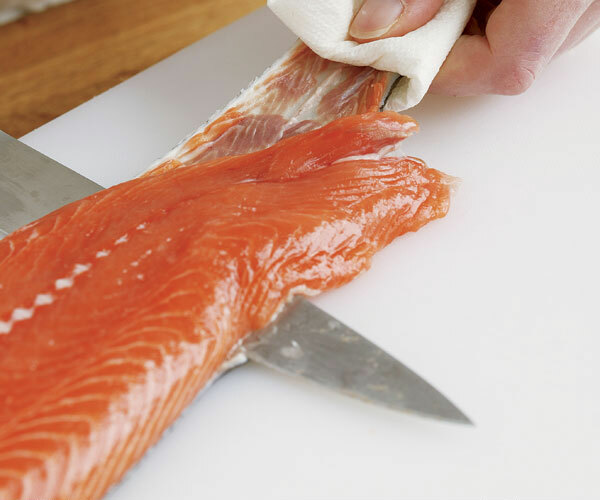 If you’ve bought a whole, gutted salmon, pat it thoroughly dry, wrap it in paper towels, and store it in a plastic bag. If you can’t cook fresh salmon right away, loosely wrap it in plastic and keep it in the coldest part of the refrigerator for no more than 2 days, or wrap well in plastic and heavy-duty foil and freeze for up to 3 months. Defrost frozen salmon overnight in the refrigerator. Put the unwrapped fish on a rack over a rimmed baking sheet or in a colander set over a bowl so that any liquid can drain away. 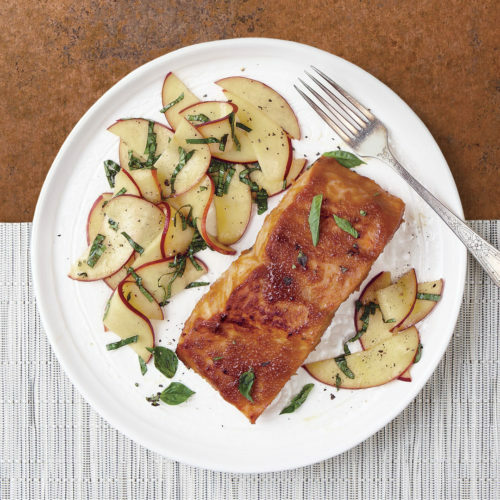 Zesty ginger-spiked vegetables are the perfect foil to this richly glazed fish. 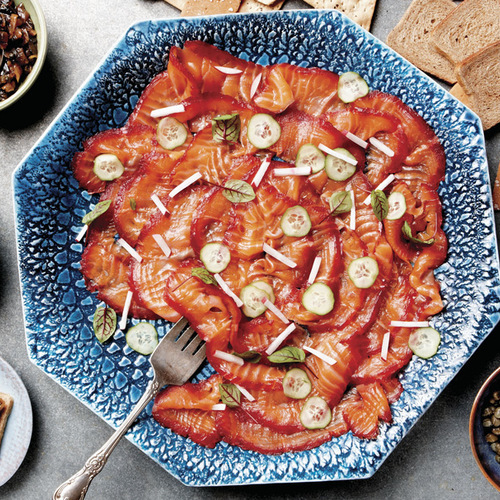 A traditional beet cure (also called gravlax) gives the salmon a beautiful jewel-toned gradation of color that adds a real wow factor when serving. 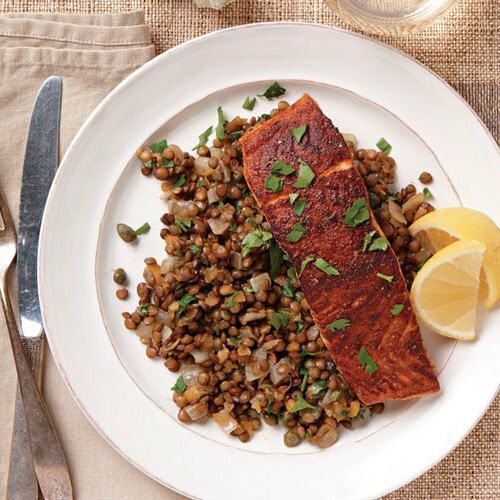 A robust mustard glaze is the perfect counterpoint to rich fish. 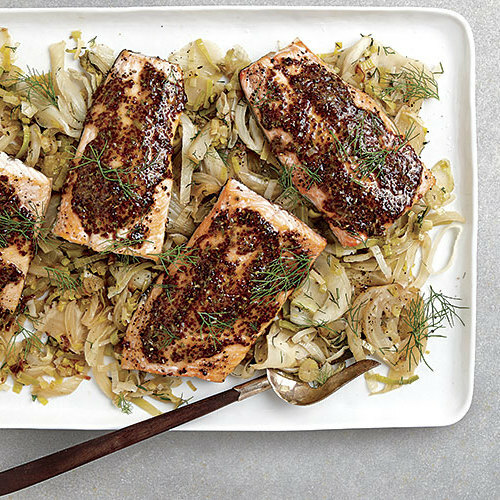 Buttery sautéed fennel and leeks make a tasty bed for the fillets. 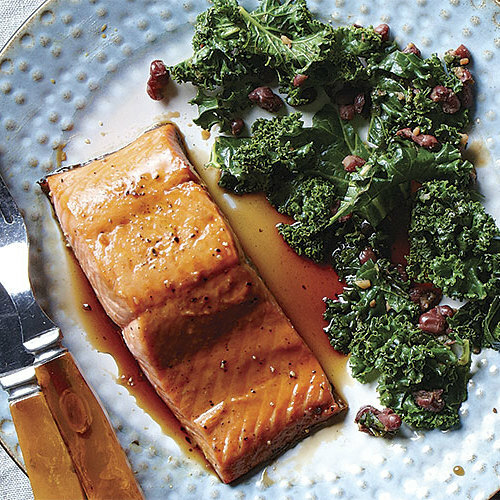 Though this glaze has just a few ingredients, it gives broiled salmon a tasty savory-sweet crust. Grade B maple syrup’s stronger flavor works well here. I need the seasonings to smoke a whole skin-on fillet. I have a great rotisserie smoker at work and I think a smoked salmon salad would be a great addition to my menu. Definitely one of my favorite fish entree's, only second to Tilapia.